UNISSULA has announced as a World Class Islamic University with its big motto “Bismillah, Membangun Generasi Khaira Ummah” (In the name of Allah, Raising the Generation of the Best People). With the motto, the University is highly committed to build the best generation through the deveopment of islamic character, personality, competence and professionality. 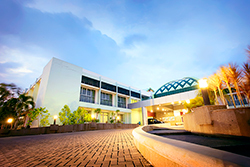 The University has grown to be a modern campus with human resources and facilities, and always opens to development. It also continues to build networks with many other national and global institutions around the world. As a part of the effort for science and knowledge reconstruction as stipulated in its Mission, UNISSULA promotes research and scientific publications. This has become a commitment to make the campus an institution which gives contribution for civilization of the world. A wide range of topics on the fields of health, engineering, social humanities, and educations are conducted, and for the pursuant for this, the university has set up a lot of joint-research and publications with several national and international research institutions. Every year researchers, lecturers, and students of the university attend and present research findings, papers, and ideas in international conferences and seminars. They also publish their works on journals on a wide range of topics domestically and internationally.